Toyota Kirloskar Motor, which introduced the Camry in India nearly 17 years ago, has carved out a cosy little spot for itself in the Indian market. Three model changes later, the company recently launched the fourth-generation model of the Camry in India at Rs 36.95 lakh (ex-showroom). The new Camry, despite bearing a steep price tag, is packed with several technological advancements in the powertrain as well as in the chassis design. Further, the new saloon now boasts of futuristic looks and voguish interiors. Auto Tech Review got up close with the new Camry on the streets of New Delhi and here is our take on it. What is now the fourth-generation model of the Camry in India is globally its eight-generation model. The new Camry has been built on the Toyota New Global Architecture (TNGA) modular platform that is lighter and boasts of higher structural rigidity. Toyota has utilised a significant percentage of high-tensile steel that has also contributed to an increase in structural rigidity by around 30 %. Observing that the new Camry is bigger than the outgoing model, we assessed that its length has increased by 35 mm and the car’s width has gone up by 15 mm. With the TNGA platform, the new Camry now gets a wheelbase that is 50 mm longer than the previous model. Along with an increase in the dimensions the Camry’s kerb weight has also gone up by around 30 kg. The new Toyota Camry also features an updated hybrid drivetrain that now comes with an e-CVT and a new fourth-generation Toyota Hybrid System. The Japanese major has also installed an updated 2.5 l petrol engine that is more powerful and efficient. To look at, the new Toyota Camry is by no means subtle; Toyota has done away with simplistic design elements, making the new Camry a real looker. On the inside the story is quite similar with unique design elements such as a ‘Y’ shaped dashboard layout that defines a modern persona and asymmetric shape. To sum up the design of the new Camry in one word, we would call it ‘dramatic’. The front features sharp projector headlamps with LED DRLs. The sedan has a bold front that is defined by a broad front grille and a chrome slab wearing the Toyota badge with a backlit blue illumination. The unique tri-wing LED DRLs add a sense of character to the saloon and a sculpted hood with distinct creases adds flavour to an already savoury dish. Move over to the side and things seem to be a bit plane-jane with rather simplistic character lines; the only spice here is from the elegant looking 18-inch alloys. Over to the rear, a crisp and broad shoulder line defines the Camry’s solid build. The rear combination lamps look contemporary and a boot lid integrated spoiler adds function to the design, making the Camry practical as well. Step into the cabin and you are greeted with opulent craftsmanship. The interiors feature a black and beige theme with unique onyx inserts on the dash, doors and centre floor console. 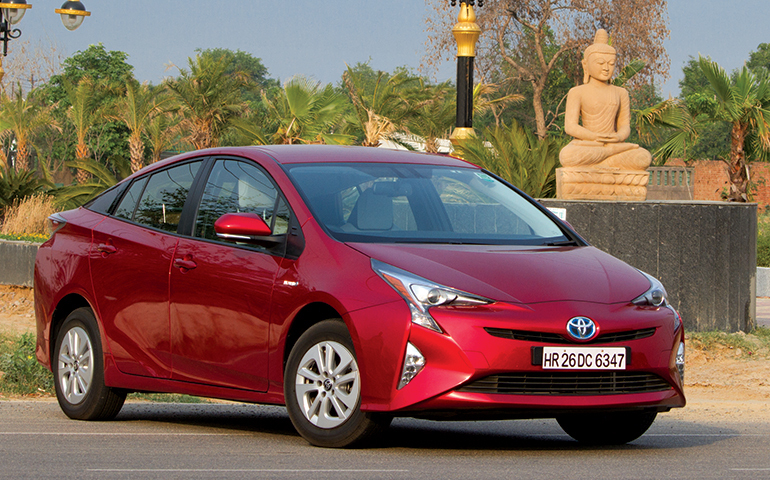 The quality of materials is a top-drawer and Toyota has worked out the ergonomics phenomenally well. With comfortable seating, Toyota is also providing plenty of kit; the list includes a touchscreen infotainment unit that comes ready for smartphone connectivity through Apple CarPlay and Android Auto. Other features include a nine-speaker JBL sound system, three zone climate control, cooled seats, electrically operated front seats, electrically operated rear privacy blinds, sunroof, cruise control, paddle shifters, steering mounted control, tyre pressure monitoring, rear AC vents, backrest recline and a lot more. The new Camry Hybrid is powered by a new 2,487 cc, four-cylinder naturally aspirated petrol motor rated for 178 hp and 221 Nm of torque. Enhancements made to the motor see a bump-up in power by roughly 18 hp and 8 Nm over the previous engine. With this new engine, Toyota has also managed a higher level of efficiency thanks to a re-designed intake valve, which improves combustion, leading to an enhanced fuel average of 23.27 km/l. Along with the petrol motor is a new fourth-generation hybrid drive set-up that uses a 254 V Nickel Hydride battery pack. The motor set-up on the hybrid system is good for 120 hp and 202 Nm, which in combination with the petrol motor offers an impressive 218 hp. Toyota has catered to an EV mode on the new Camry that offers pure electric driving. The smooth and silent functionalities of the EV mode offer a fulfilling experience. Give more to the throttle and the engine jumps to life with a mild shudder, kicking in seamlessly. Speaking of silence, the NVH dampening on the Camry is good and does not seep much into the cabin of this saloon. Despite the engine kicking-in from time to time, the refinement also does prove beneficial for cabin comfort with minimal vibrations and noise. Cruising in the city or on highways in the new Camry has proven to be a richer experience; this is also thanks to the e-CVT system that toils away smoothly. When you do plan to push the vehicle hard, the transmission does get a bit noisy though. With the new TNGA platform, Toyota has been able to improve the driving dynamics on the new Camry. The vehicle rides surefooted even under demanding conditions. This is also because the centre of gravity on the Camry is now lower, thus resulting in a 25 mm reduction in the overall height. The company has also changed the location of the battery pack that now sits under the rear seat, furthering the cause of handling and balance. The suspension system works in full synergy with the vehicles dynamics to deliver a plush and comfortable experience, be it behind the wheel or while being chauffeured. The steering set-up is smooth and weighs up nicely at higher speeds. It is interesting to note that Toyota has also made the Camry more manoeuvrable with an increase in turning circle radius. The new Toyota Camry is the epitome of blending luxury and technology, at least in the price bracket that it sits within. The saloon offers comfort, performance and now comes with a lot more character. With a price tag of over Rs 36 lakh, the Camry sits in the big SUV territory. Despite this Toyota has consistently garnered reasonable sales volumes to justify the return of the Camry in a new avatar. Facing competition from the likes of the Honda Accord, the new Toyota Camry does seem to sweeten the deal with its updated hybrid powertrain and added creature comfort features. This is bolstered by additional safety features such as nine airbags, ABS with EBD, brake hold, electronic parking brake, vehicle stability management & traction control, park assist and a lot more.